WAIST HIGH: Echo & The Bunnymen Celebrate 30 Years. 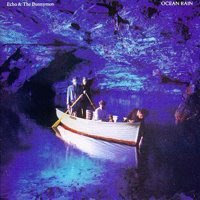 Echo & The Bunnymen Celebrate 30 Years. "Modern rock innovators Echo and the Bunnymen will make a triumphant live return to New York's Radio City Music Hall on October 1, where the band will be performing their landmark 1984 album, Ocean Rain, with an orchestra as part of its 30th anniversary celebration. Pre-sale tickets can be had through the band's official website beginning April 26, with tickets available to the general public a week later." The album, widely considered their best, is #38 on The Observer's 100 GREATEST BRITISH ALBUMS list. The band will play at Liverpool's Echo Arena on Nov. 27, almost 30 years to the day after they played their first gig at Erics in Liverpool. The group's current incarnation comprises Ian McCulloch and Will Sergeant along with Stephen Brennan (bass), Gordy Goudie (guitar), Nicholas Kilroe (drums), and Ceri James (keyboards). The band will release a new album, The Fountain, this summer. The album will be preceded by a single, "Think I Need Two," on Jul. 14. In related news, McCulloch is set to publish his memoirs next year. "Book publisher Transworld recently bought the rights to the singer's memoirs from Mayer Benham, and plans to publish them in summer 2009. Simon Taylor, editorial director of Transworld, said in a statement: 'The man is a one-off, an iconic figure whose passion for words, music and for his city is utterly infectious.' A title for the singer's memoirs is yet to be decided."